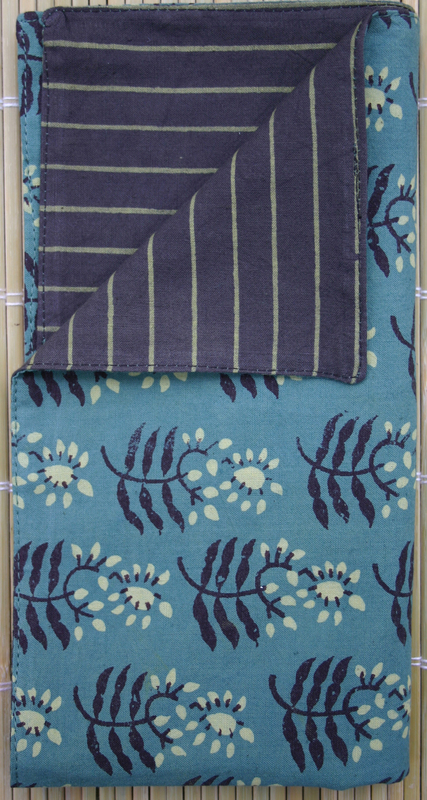 GIVEAWAY: Enter to WIN a gorgeous fair trade, organic, vegetable-dyed napkin set! Marigold Fair Trade is excited to announce a giveaway in celebration of this week’s unveiling of our new blog! Marigold works with a co-op of over 300 women from the slums of Mumbai, India and an association of 500o organic cotton farmers to make fashionable fair trade clothes and household items. Our beautiful line of products are vegetable-dyed and hand block printed or organic. Your purchase helps a disadvantaged woman make herself more economically self-sufficient and supports organic farming. Hand block printing is an age-old artisan tradition that dates back to the 12th century in India, but it is an art form that is dying due to mass produced manufacturing. We believe in honoring and celebrating the tradition of block printing to bring you clothing that is a work of art created by hand. Marigold is a proud member of the Fair Trade Federation and Green America. We are also proud members of the South Sound Clean Clothes campaign- a coalition of concerned citizens raising awareness about the sweatshop industry, and challenging individuals as well as public and private institutions to create positive change by altering their purchasing practices and Washington Fair Trade Coalition. We are proud members of the Fair Trade Federation, Green America, South Sound Clean Clothes Campaign and the WA Fair Trade Coalition. Entry filed under: Giveaway. Tags: contest, fair trade, giveaway, gorgeous, india, marigold fair trade clothing, mumbai, napkin, napkin set, organic, win. My favorite item at the Marigold FTC store is the Reversible Bag in turquoise! Such a stunning fabric color and, what can I say, the bag has the utility of being reversible to boot! 🙂 I just found your website/store today and I’m already in love. Thanks for supporting this cause and I look forward to seeing your business flourish! I’m a fan on Facebook, too (Bao N.) … but I don’t have a Twitter account. My favorite item is, hands down, the Chaela dress. I am in LOVE with it! The cut and fit are so flattering and feminine. It is my new favorite dress, and it is so comfortable that I wear it for any and every reason I can. And knowing that it is truly fair trade… I can feel great about how it looks, AND about how it was made. I am a huge fan! 🙂 I have been telling many people about your site. I really like what you’re doing. I’ll follow you on twitter now! I hope you follow me back. I have a fair trade company too. We put fair trade distributors on Facebook. It’ll be nice to talk about it. My fav item is definitely the Marigold jacket in Spruce Floral. I just love the Mandarin style color and fit, and the frog buttons. The color and fabric is stunning and the length makes it great to wear on its own as a top, or as an outer shell. The price is really great, and hey, it’s on sale right now! Very nice website. Love the concept of Fair Trade. Especially like that there isn’t an overwhelming amount of items. It gives a consumer the time to really appreciate each and every design, color and item. I enjoyed browsing through everything you offer. My favorite is the Marron Leaf 60×90 Table Linen. I LIKE Marigold Fair Trade Clothing on Facebook. I’m victoria lester on fb. I love the table linens best; I don’t do yoga, I make a lot of my own clothes, bags and cards, but I don’t have any table linens that I truly love. The brightly colored patterns offered would absolutely make my dining room, and maybe even prompt me to invite more guests over! The Paisley Skirt is *fantastic*! Well cut and original, the colors are flexible and fun, making it all around suitable for work or casual wear. I dig flexible clothing that I can feel good about wearing. My favorite Marigold Fair Trade product is the Bell Button Top. The flowing bell-shaped open sleeves, graceful neckline, and intricate textile pattern all add up to one simply lovely blouse. I also love the napkins and Housewares collection. Seeing the various colors and patterns that are available is what I call “candy for the eyes”! I love finding companies like yours that are helping women and men to develop constructive livelihoods that lift them out of poverty and bringing their beautiful artistic handicrafts to a broad market. The Marigold Jacket is gorgeous. I agree with your description of the color as “joyful”! The button style certainly adds flair, too. A festive jacket in every sense of the word! I love the linens! The colors are gorgeous and will look awesome in my house–just in time for my first dinner party! My super-cute, super-pregnant boss looks AMAZING in the Elise Dress.